This soft rock tune owes much of its success to the Coca Cola advert that it featured in during 1987 and 1988. Released on October 14th 1988 in the UK, the song topped the charts just over a month later on 19th November and stayed there for three weeks. 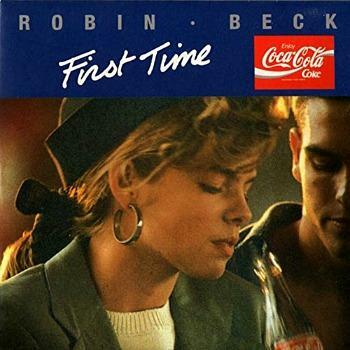 This was Robin Beck's very first hit song, and also her last in the UK. Further singles failed to make much of an impression on the charts, with the follow-up single "Save Up All Your Tears" stalling at an unimpressive #84. However, the song was a hit across Europe, reaching the top ten in Germany and Switzerland. Two separate videos were released for the single. One simply featured Beck with her band and this was filmed in a style very typical for metal bands of the 80s. The other video featured an unimaginative and weak storyline and was shot mostly in black and white. It starts with the singer applying make-up in the bathroom mirror and then looking at her watch. She then rushes to the phone to make a call before replacing the receiver within seconds, not really giving anyone the chance to answer her call. Maybe she changed her mind? I've no idea! The rest of the video is a pretty dull and cheesy affair and features the singer reminiscing about her first love - cue lots of sickly-sweet imagery with the couple running around on a beach holding hands, kissing, hugging etc. with lots of water splashing around. It's all very predictable and uninspiring but does what it says on the tin, I guess. During 2014 Beck was busy with her Perfect Storm tour to promote her latest album Underneath. She was supported by Estrella and her husband's band House Of Lords for which he is the frontman. 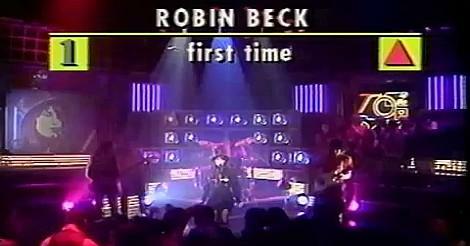 During the early days of her musical career Robin Beck was a backing singer for Chaka Khan and Leo Sayer. Her first album Sweet Talk (released in 1979) featured backing vocals by Luther Vandross and Irene Cara. Following the commercial failure of the album, it was ten years before the singer released another one. 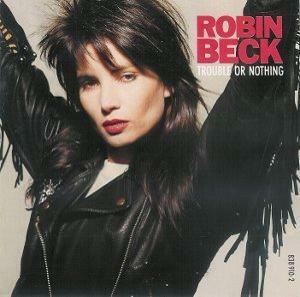 Trouble Or Nothing (1989) was moderately successful in Germany, Switzerland and Sweden and included her hit First Time as the final track. In 2006, the Swedish electronica band Sunblock released a cover version of First Time which reached #9 in the UK. Interestingly, the group also remixed the Baywatch theme tune I'm Always Here during the same year.